Denmark's second largest city, Aarhus (or Århus) lies on the east coast of Jutland where the river Aarhus Å flows into picturesque Aarhus Bay. First mentioned in 928 AD as the see of a Bishop, it received its municipal charter in 1441, and throughout the Middle Ages, served as an important commercial, seafaring, and fishing center - a tradition that lives on due to the area's popularity among sports anglers. Over the centuries, trade in agricultural goods spread to Germany, the Netherlands, and Norway, and merchants from other countries also settled here. The wealth they helped create is still evident in the many well-preserved Renaissance buildings around the city. Now an important cultural center, Aarhus boasts a university along with important art facilities and museums, while its vibrant music scene embraces folk, jazz, chamber music, operatic performances, and church concerts. The ARoS Aarhus Kunstmuseum, one of the largest art museums in Europe, is housed in an impressive ten-story building that is itself a work of art. Opened in 2004, ARoS (the old Latin name of the city) is still evolving with new features and attractions being added as recently as 2011, when the massive circular skywalk entitled Your Rainbow Panorama opened to worldwide acclaim. The real highlight of a visit though, is the museum's stellar collection of artwork from the Danish Golden Age (1770 to 1900), Danish Modernism (1900 to the 1960s), and contemporary art. Afterwards, stick around for a little sustenance at the onsite café or restaurant, and take in a show, a lecture, or a guided tour. The Old Town (Den Gamle By) is an open-air museum consisting of more than 75 historic buildings collected from across Denmark, dismantled, and reassembled in Aarhus for preservation. Dating from the 16th to the early 20th century, this remarkable collection has been assembled as if it really was an authentic old town, an effect enhanced by the superb old houses, shops, workshops, and windmills. Highlights include the old Burgomaster's house from 1597, home to a fine collection of furniture; as well as a merchant's house; a stilt-house; a two-storied stone house; and a storehouse. The largest building is the majestic Coin Master's Mansion, a newer "old" addition erected on the site in 2009. A toy museum, textile museum, and historical musical collection are also worth seeing as is the bicycle museum; apothecary's shop (complete with healing herbs); and the workshops once belonging to candlemakers, coopers, and shoemakers. The museum also holds special exhibitions of historical costumes. Five restaurants and cafés are located on site, some serving traditional hearty foods. A short drive south of Aarhus is the superb new Moesgård Museum. Built on the grounds of the Moesgård manor house where the original museum was housed, this well designed attraction opened in the autumn of 2014 and offers a comprehensive account of Denmark's history from the Stone Age to Viking times. A particular attraction is the Grauballe Man (Grauballemann), a corpse dating back more than 2,000 years that was found perfectly preserved in a nearby bog. In the open-air section of the museum is a fun Prehistoric Trail (Oldtidssti) through the woods and fields of the estate, passing reconstructions of prehistoric houses and burial mounds along the way. 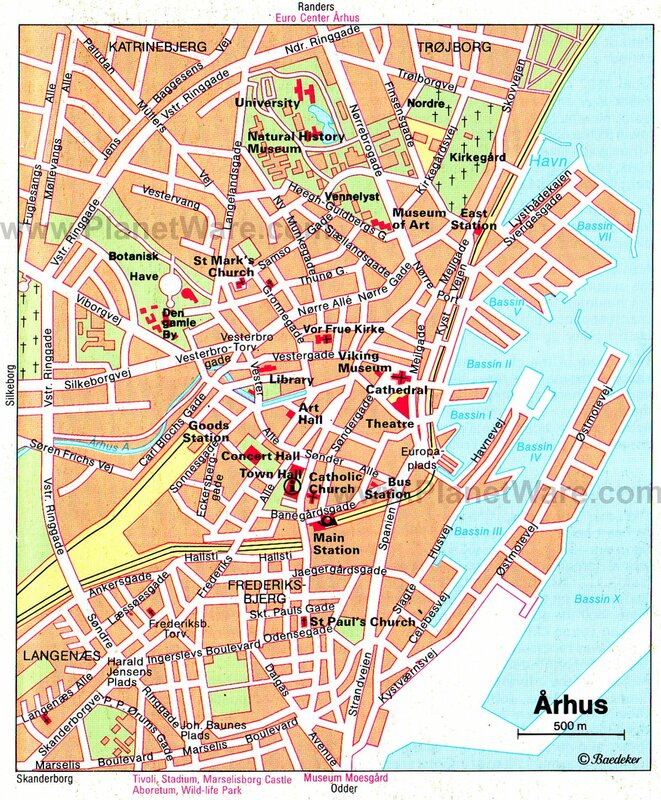 The inner city of Aarhus consists of a semi-circle enclosed by a ring road (Ringgade), and at its heart lies the Great Market (Store Torv) in which stands Aarhus Cathedral (Sankt Clemens Kirke), dedicated to St. Clement. While the original structure was begun in the 12th century, the current church dates largely from the early 1500s, with some Romanesque features still to be found in the external walls (the chapels on the east side of the transepts also date from this time). The present façade with its single tower and anchor motif dates from the same period. Highlights of the beautifully bright interior include the winged altar from 1497 with its rich array of figures, along with the beautifully carved 16th-century pulpit, two organs, and a font. The vault paintings date from the 15th century and portray St. Clement as the patron saint of the church and Christ sitting in judgment. On the south side of busy Rådhus Plads stands the City Hall (Rådhus), built in 1941 to plans by architects Arne Jacobsen and Erik Moller and one of the few such municipal buildings ever built in Denmark. Faced with Norwegian marble, the highlight of the building is its stunning 60-meter-high tower with fine views of the city and bay. Interior tours include a visit to the Civic Hall, the Council Chamber, and the Marriage Room, each beautifully designed and edged in sumptuous wood trim and accents. Also of note is the nearby Pig Fountain, or Grisebronden (it's nicer looking than it sounds), and at the foot of the City Hall tower is a lovely fountain called Agnes and the Water Carrier. In the basement of a large bank, the Viking Museum (Vikingemuseet) consists of collections based upon the discoveries made by builders when excavating the bank's foundations in the 1960s. The museum paints a fascinating picture of the Viking community that made Aarhus its home some thousand or more years ago. Highlights include remains of the ramparts that once surrounded the settlement, a reconstruction of a typical house from the Viking period, and ancient tools. Try to plan your visit to coincide with the famous Viking Moot at Moesgård Beach event, a fascinating weekend in July that attracts would-be Vikings from across Europe to share in the culture and lore of this fascinating period of Danish history. Highlights include battle reenactments and displays of horsemanship, along with traditional Viking boat building and sailing displays. Built between the 13th and 15th centuries, the Church of Our Lady (Vor Frue Kirke) was originally part of a Dominican priory and remains one of the largest churches in Denmark. Now a purely Gothic building, it contains many fine frescoes and a magnificent altarpiece dating from 1520. Of particular interest is an even older church discovered during excavations in 1955. Dating to the mid-11th century, this little stone church has been carefully restored and can be seen when visiting the Church of Our Lady. Also of interest is the Chapterhouse, dedicated as a church and notable for its medieval wall paintings. Aarhus Botanical Garden (Botanisk Have) was founded in 1875 and covers an impressive 53 acres. Highlights are the large hothouses with subtropical plants from around the world, recently renovated with the addition of a large tropical dome. The gardens are home to a variety of fun summer programs for kids, as well as concerts and shows in the on-site amphitheater. It's also a pleasant place for a stroll or a picnic, with numerous paths, two small lakes, and plenty of open green space. Marselisborg Palace (Marselisborg Slot), built in 1902 as a gift from the Danish people, has since been the summer residence of Danish royalty. When the queen and her family are in residence, the Changing of the Guard takes place at noon everyday, and is a spectacle that's worth seeing. While the palace itself isn't open to the public, the surrounding gardens and parklands are. Highlights of a visit to this 32-acre park are its large lawns with their many sculptures and ponds, as well as flourishing rose and herb gardens. Also of interest is the nearby Memorial Park (Marselisborg Mindepark), laid out in memory of the Danes who fell in WWI. Founded in 1982, the Women's Museum (Kvindemuseet) in Aarhus is an important and unique facility specifically designed to gather and preserve knowledge and information pertaining to the lives of the country's women and their role in society and culture. Highlights of this research-oriented facility include exhibits and displays focusing on historical and topical themes, including women's roles in the workplace, home, and art. The exhibits also explore the changing attitudes of society over the centuries. Villa Provence: luxury boutique hotel, lovely courtyard, delicious breakfast, Provencal-style decor, individually decorated rooms. Scandic Aarhus City: mid-range pricing, modern decor, excellent buffet breakfast included, bike rental. Hotel Oasia Aarhus: 3-star hotel, near the train station, contemporary style, free coffee. Zleep Hotel Aarhus: budget hotel, outskirts of the city, family rooms, free parking. While there's no shortage of things to see and do in Aarhus, plenty of fun awaits outside the city. If traveling with kids, a must-see is Tivoli Friheden (Tivoli Freedom), a theme park that also serves as a venue for concerts. Also worth visiting is Rosenholm Castle, a lovely 16th-century Renaissance building that's been owned by the same family for more than 400 years. Highlights include its many finely furnished rooms decorated with paintings and tapestries, as well as a lake and Renaissance pavilion in the park. Another historic site worth seeing is the famous church in Thorsager, Jutland's only surviving Round Church. Parts of this two-story building date from the early 13th century. The upper story is accessed by an old winding staircase and was once used as a gallery for local nobility.